Koki roti, i first tasted in Kailash parbat Singapore. I vividly remember, one day me and hubby went for shopping and were very hungry after that. Went into Kailash Parbat, ordered a chaat platter , lassi and this koki too. But after the lassi and chaat platter we can't finish the koki roti as it was loaded with ghee. It was so nice and from that day itself i wanted to try this at home. 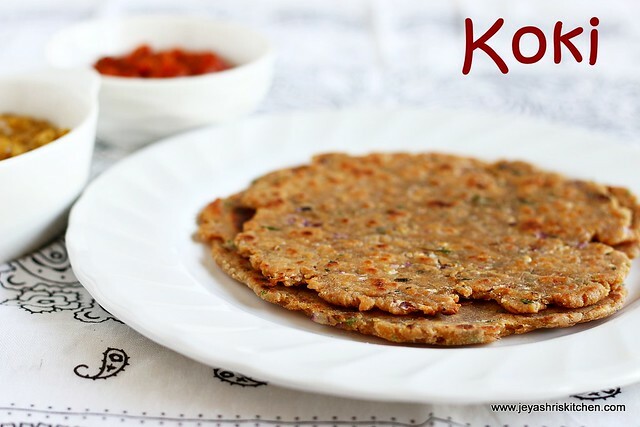 Koki is traditonally a Sindhi recipe. I finally tried this last week. We all enjoyed this at home. Traditionally it is shalow fried in ghee, but i didn't do it at home. But if you like, you can add more ghee while cooking. Though u see cracks in the edges of the roti, it was very soft and not dry. The method by which we make makes it to look like that. Try it at home and let me know how they turned out. I slightly adapted the recipe from a Sanjeev kapoor's recipe. Crush the coriander seeds coarsely. Chop the onions, coriander leaves and green chili very finely . In a wide bowl add the atta, chopped onion, coriander leaves, green chili, crushed corinader seeds, ajwain, salt, red chili powder, besan(if adding), rava, anardana powder and kasoori methi. Mix this well with your hands. Add enough water to make it into a soft pliable dough. Keep it aside covered for 15 minutes. Divide this into equal big lemon sized balls. Take one portion and dust this with flour and pat with hands to make a small disc. Roll this gently to form a roti. Let ti be bir thick and not too thin as phulkas, must be like parathas. 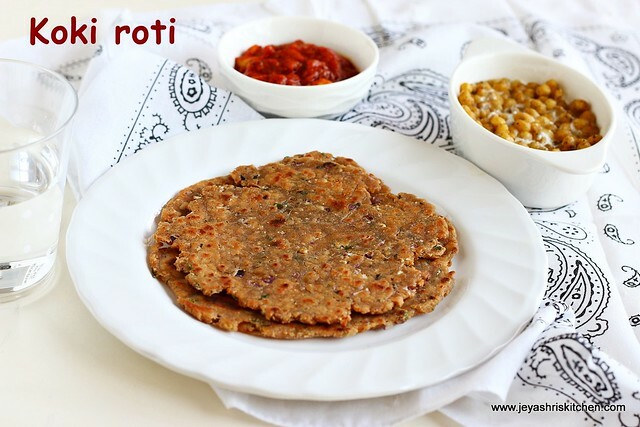 Heat a pan, place the roti on this and quickly keep for 2 seconds on both sides. Immediately take this out and make it into a ball again. 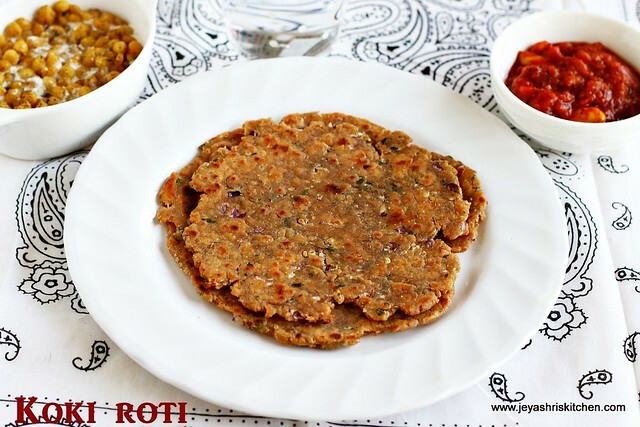 Do not over cook the roti, else it wil be very stiff and you will find it very difficult to roll the roti . Also the koki will be hard then. Now roll the roti slightly thick as how you rolled before. Heat a pan and cook on both sides. Apply ghee on both sides while cooking. If you waould like to follow the traditional method, shallow fry this with ghee. Koki is ready to serve. You can serve this with simple raitha and a pickle. I served with boondi raitha and Tomato pickle. Will we not feel that coriander seeds when chewing?i dislike that taste.May be we can add powder..Right.